Epic 32757. 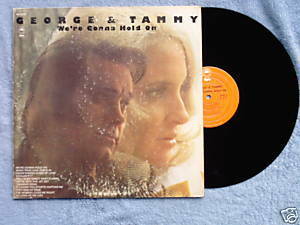 We're Gonna Hold On 1973 LP from George Jones Tammy Wynette includes title track, When True Love Steps In, Never Ending Song Of Love, Wouldn't I?, Roll In My Sweet Baby's Arms. Background vocals by The Jordanaires. Cover design by Bill Barnes. Produced by Bill Sherrill. Vinyl is VG/VG; cover with photos is VG with some ring and corner wear.